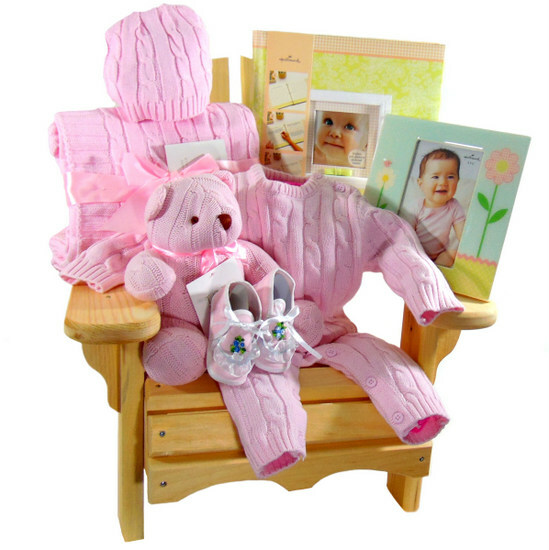 Baby first Muskoka chair girl Canadian handmade pine wood filled with all matching 100% cotton pink bear, blanket, baby one piece romper, picture frame and baby shoes. 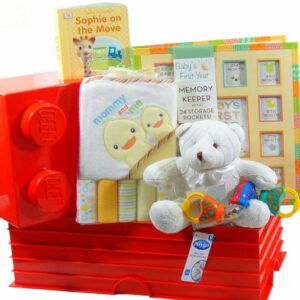 This baby girl gift basket will be hand delivered for free in the Toronto area.One of our best sellers of baby gift hampers baby gift baskets filled with newborn products to welcome new baby girl to the world. Baby First Muskoka chair girl. Canadian handmade pine wood filled with all matching 100% cotton pink bear, Cotton knitted blanket. Baby pink one-piece romper. Hallmark first year book. baby shoes. Cotton knitted pink hat. Also the best Baby Shower Gift Basket. Baby First Muskoka Chair girl will be a great addition to newborn girl’s room. The baby girl will use the chair for years to come.